This entry was posted in city council, Environment and Ecology, Health and Medicine, SciBlogs, science, Science and Society and tagged contamination, fluoridation, fluoride, heavy metals, SciBlogs. Bookmark the permalink. 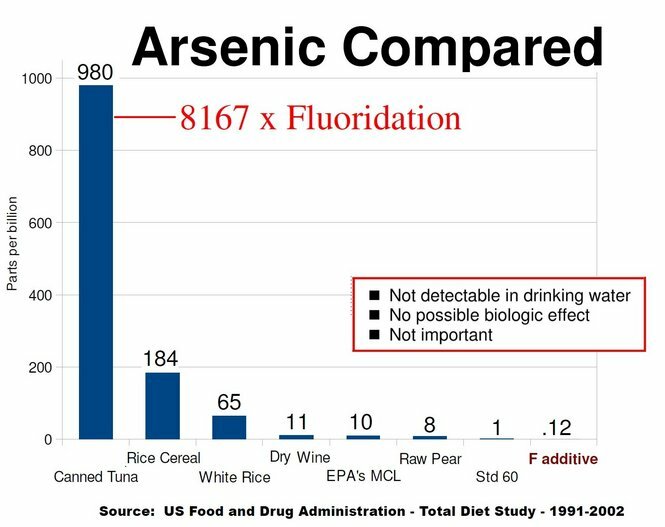 Adding a comparison to arsenic found in everyday foods makes even clearer the bogus nature of opponent’s claims with respect to arsenic and other microcontaminants in fluoridation water additives. Deal Lord, how obtuse are you people? The problem is not the level of contaminants in my drinking water, it is that what is added has never been tested in terms of its possible or actual impact on my bones, tissue and organs. I have asked WDHB for the science they use to support their pro fluoridation position and after 9 months and a number of requests I have not had a response. All they refer to is the 2000 YORK review and we know what Professor T Sheldon wrote about that in 2003. Bojangles, I guess I should take it that your apparent attempt to divert as an acceptance of my point about As contamination in fluoridating chemicals being minuscule compared with the natural As in the river water? As for “what is added” being untested you are being disingenuous. Fluorosilicates decompose on dilution in water so the relevant species in drinking water is the hydrated fluoride anion. This has been tested extensively. Please don’t be stupid. It’s embarrassing to read. They can be at safe or unsafe or genuinely dangerous levels. The big question is “Is it safe to drink”? That’s where the water authorities come in. They check the water to make sure the water coming through your pipes is drinkable. In some parts of the world, it’s not drinkable….so they warn everybody not to use the water for drinking. They put signs up and everything. Governments have to provide drinking water for their citizenry. It’s their job. Otherwise there’s hell to pay. Can’t very well run a city with people dying of thirst. Bit awkward. Can have them dying of dysentry either. So they monitor the water. They treat the water. The water can have arsenic in it. Yet water can have arsenic in it and still be fine to drink. As long as the contaminant level is low, then it doesn’t matter. That goes for anything…..including fluoride. …it is that what is added has never been tested in terms of its possible or actual impact on my bones, tissue and organs. Nope. Science knows all about fluoride. It’s hardly mysterious. It’s been tested up the wazoo. That’s why water authorities routinely add fluoride to drinking water. Chlorine too. Now stop lying. It won’t help you. With respect to arsenic, it has shown to be an essential nutrient in a number of species (Uthus 2003). Synthetic diets are necessary to cause arsenic deficiency because of its universal presence in diets. Also, the main public health concerns, that arsenic can cause lung and bladder cancer have a threshold of 151 yg/L. Clearly the few molecules of arsenic which attend adjustment of drinking water fluoride to optimal are biologically insignificant. Cedric – you accuse me of lying. About what specifically? There is also lead and there is no acceptible level for lead going into drinking water. You profluoridationists are think it is OK to put poison in the water. It defies logic. Clay – have you any idea how much lead contamination there is in fluoridating chemicals? Actually far less than arsenic. The last batch of fluorosilicic acid used in Hamilton City had measured lead content of 0.09 ppm Pb. 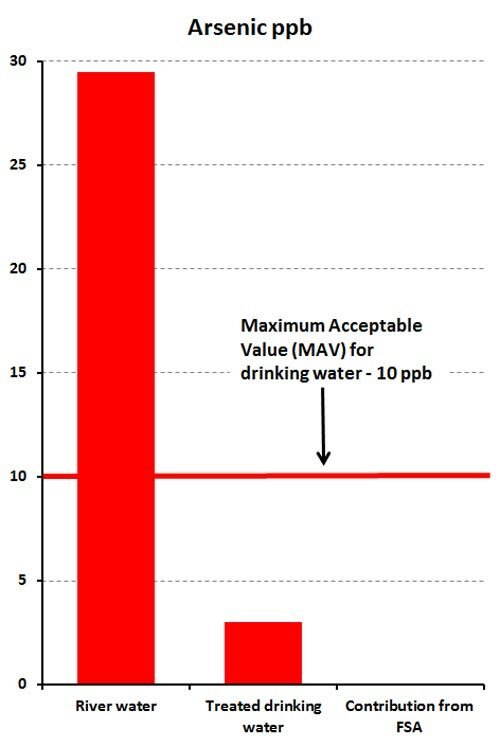 The regulatory maximum for this chemical to enusre it contibutes less than 10% to the maxximum acceptable value (MAV) in drinking water is 132 ppm Pb! The amount of Pb in fluorosilicic acid is extremely small. No, I don’t think it is OK to put poison in water – that’s why I support regulations aimed at preventing this. But I also do not think it is OK to tell fibs about the real situation to scaremonger. There is no fib. There is lead and there is NO safe level for lead. To insinuate otherwise is deceptive. Shame on you. Is English your second language or something? Stop being deliberately thick. It won’t help you. Clay, the Maximum acceptable value of Pb in drinking water is 0.01 ppm Pb (see NZ Water and Wastes Association Standard for “Water Treatment Grade” fluoride, 1997.). To contribute that amount to drinking water the fluorosilicic acid would have to contain 1320 ppm B. It is a very large dilution. As I said, the last batch of fluorosilicic acid used in Hamilton City had 0.09ppm Pb. That is a huge difference, isn’t it? In fact fluoridation chemicals prove not to be a major source of contamination to drinking water – the flocullation chemicals contribute more. There is NO safe level of lead for drinking water. One miniscule particle in the blood and settling in an infants brain and IQ drops significantly. Those who push fluoridation are reckless. Clay, do you disagree with the health authorities who set the regulations? Th fact is that nothing is absolutely pure – all your food and water contains some lead at extremely low levels. In the case of drinking water the amount is usually below the analytical sensitivity. For example, in (fluoridated) Wellington the anlaysis shows <0.01 ppm Pb. I repeat, the amount of Pb in fluorosilicic acid used for fluoridation are so extremely low that it can not be detected on dilution in the finished water. Most probably the natural water and other chemicals used for treratment, pipes, etc., contribute much more than the fluoridating chemicals. Those who use such dishonest arguments in their anti-fluoridastion poropaganda are reckless. You are scare mongering about nothinhg. There is NO safe level of lead for drinking water. The logic of a homeopath.